Seat space in airplanes has become increasingly cramped in the past few decades, making in-flight drowsing a tough challenge. 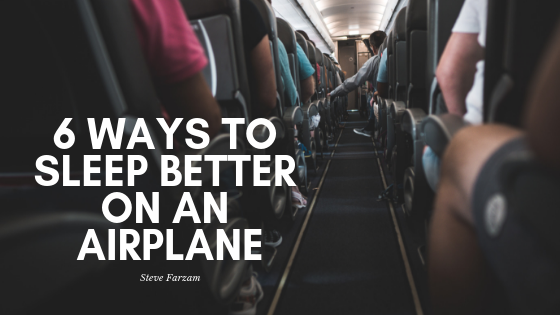 Luckily there’s a lot that can be done to make your next airplane snooze more enjoyable. Here are 6 ways to sleep better on an airplane. Consider leaving the business suit in the checked baggage and instead opt for something like leggings, sweatpants, a tank top or a sweatshirt. Wear comfortable footwear (with socks ), or include a pair of house slippers in your carry-on for you to slip into when you’re ready to catch some Zs. Sinus problems are not only a problem for those who suffer from them, but also for those around them. Clogged sinuses can make you feel like you’re suffocating, especially when traveling miles high in the sky, so remember to pack any needed allergy medications. If you’re known for snoring, consider products like Breathe Right strips to alleviate the issue. The ubiquitous neck pillow has been a companion to tired travelers for decades, but a rolled towel wrapped around the back of the neck can be used as an alternative. Anything is better than waking up drooling on your seatmate! Lower lighting is essential for proper rest. Melatonin, a hormone naturally produced in the human body, contributes to the reduction of cancer risks and helps prevent depression, but light disrupts the body’s process derailing this essential component of health. It’s impossible to escape all light on an airplane, but wearing a soft sleep mask can help convince your mind that it’s night and time for bed. In a study conducted by the University of Sussex in 2009, it was found that stress levels were reduced by 68% in individuals who read books before bedtime. Fortunately for travelers, most mobile devices make the perfect on-the-go libraries for eBooks. No mobile device? No problem. The cozy feeling of cuddling up with a good, physical book is without equal. No matter how quiet the flight cabin may seem at first, loud noises from other passengers are unwelcome surprises that are bound to occur sooner or later. Invest in noise-canceling headphones or earbuds and enjoy the peace of your own personal sound bubble.